The World Resources Institute partnered with Blue Raster to create an interactive map viewer that shows development in the forests of the Democratic Republic of Congo (DRC). Designed using ESRI ArcGIS Server 10 and the Flex API 2.2, this forest atlas allows the viewer to examine in detail logging and mining concessions, protected areas, roads, and detailed change in the forests, which cover two-thirds of the country’s territory and serve as one of the planet’s major forest carbon sinks. The user can view the information in both English and French by themes such as forest zoning, concession date, timber production, mining, vegetation, and forest cover change. Further, the adjustable transparency of the map layers enables the user to view the base map data underneath. The government of DRC faces challenges in developing comprehensive forest management, zoning processes, and management of logging, mining, and agriculture. Forest Atlas of the DRC provides easier access to current forest land allocation in the DRC and will help improve land use planning, monitoring, and resolution of conflicts over resources in areas of overlapping claims. It will also help local NGOs and communities understand government actions and defend their access rights. The DRC Forest Atlas map viewer is the first in a series of interactive maps focusing on forest developments and change. Over the coming months, additional map viewers will be available for other central African countries and Indonesia. 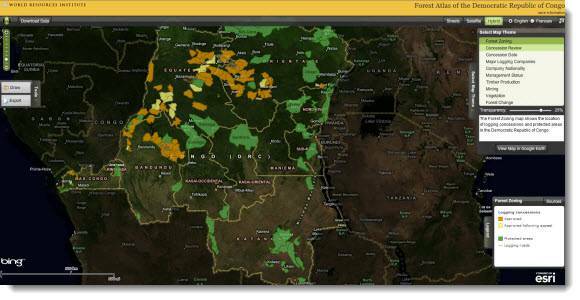 For more information regarding the World Resources Institute Forest Atlas Project please visit http://www.wri.org/stories/2011/04/new-map-viewer-shows-development-forests-democratic-republic-congo.